Fiber internet is great no matter who's laying it down. Gigabit connection speeds? Hell yes. But if you thought that was fast, researchers in the UK have something better that will not only blow your hair back, but blow it right off: a 1.4 terabit connection, and all with commercial-grade hardware. Developed by a joint research team from French telecoms company Alcatel-Lucent and BT, the magic of this incredible connection isn't in fancy hardware. Instead, it's in a new protocol named Flexigrid that lets you lay multiple signals over the top of each other in a a single cable, which lets data race from point A to point B in parallel. When layered all together, seven 200 Gbps channels form one, mega "Alien Super Channel" that offers the 1.4 Tbps speeds across a 255 miles stretch of fiber that already exists between the BT Tower in London and a BT research campus in Suffolk. 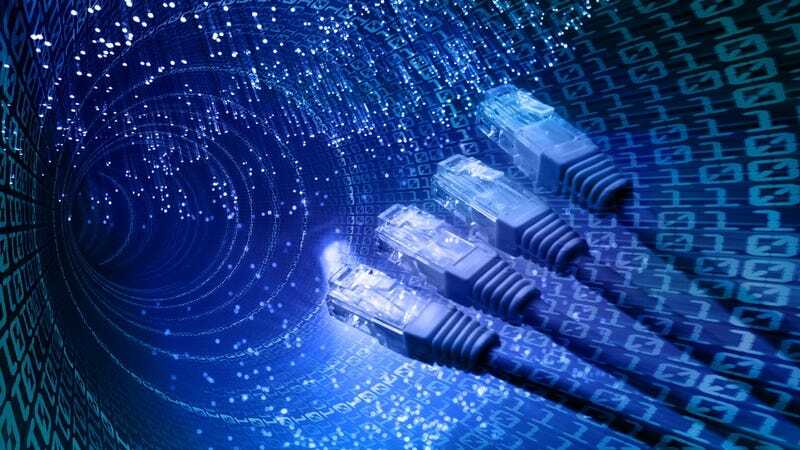 We've seen some other impressive advances in connectivity recently too, like 200 Gb wireless connections through a combination of hardware and a software advancements. But 1.4 Tbps through pure protocol is especially exciting because it doesn't require any infrastructure changes. This could theoretically run on the fiber (much of which is lying useless) in the ground right now.